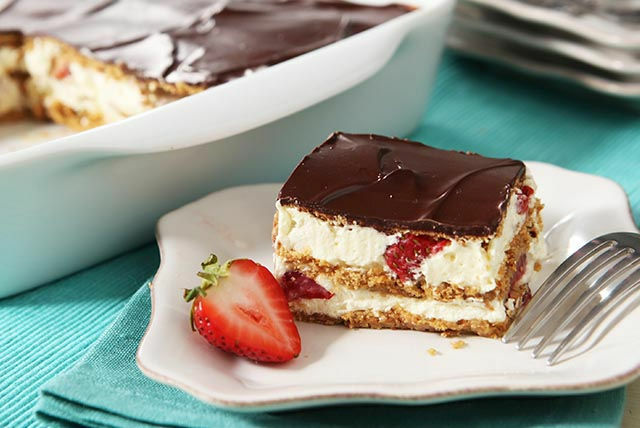 Layered with creamy pudding and sliced fresh strawberries, this éclair-style extravaganza is a sure bet to win over the dessert crowd. Beat pudding mix and milk in large bowl with whisk 2 min. Stir in Cool Whip. Layer 1/3 of the graham wafers, half the Cool Whip mixture and 1 cup berries in 13x9-inch pan, breaking graham wafers as necessary to fit in single layer in pan; repeat layers. Top with remaining graham wafers. Microwave chocolate and butter in microwaveable bowl on HIGH 2 min. or until butter is melted, stirring after 1 min. Stir until chocolate is completely melted and mixture is well blended. Spread over graham wafers. Sprinkle lightly with unsweetened cocoa powder just before serving.